Smith is a former NFL running back who played League for fifteen seasons during the 1990s and 2000s. He is a devout Christian and openly shares his faith. Call Christian Speakers 360 at 1.800.966.1380 if you would like to contact a Emmitt Smith booking agent for a speaking engagement, personal appearance, church function or other faith-based event. Christian Speakers 360 is a Christian talent agency for booking athletes, celebrities, ministers and entertainment. Emmitt Smith speaks about Christian values. Many of our speakers are born again Christian evangelicals who honor Jesus Christ's message through communities, schools and ministries. For information on Emmitt Smith's appearance fees, speaking costs and availability, contact Emmitt Smith's booking agent for details. Smith is a former NFL running back who played League for fifteen seasons during the 1990s and 2000s. He is considered one of the greatest and the single most complete running back in NFL history. 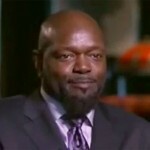 In 700 Club interview, Emmitt said he became a Christian at an early age, but it wasn’t the top priority in his life. His dream was to play for the Dallas Cowboys and to become the NFL’s all-time leading rusher. But throughout high school, he was told he didn’t have the size or the speed to make it in college, much less, the NFL, but that didn’t discourage him. “Well, I mean it, it bothered me to hear them discredit my ability,” says Emmitt. “I used it as fuel. I used it as motivation. I used it as something to keep me going and striving to continue to be successful. Because they didn't hold my destiny in their hands.” In 1987, despite the obstacles, Emmitt earned a scholarship to the University of Florida. Before he left his grandmother gave him a Bible verse that would help him face the challenges that lay ahead. “Proverbs 3 and 6,” remembers Emmitt. “Trust in the Lord with all your heart and lean not unto your own understanding. In all thy ways acknowledge him and he shall direct thy path. Anytime I found myself in a situation, I would lean on that verse.” With that verse rooted in his mind, he silenced many of his critics by breaking over fifty records and becoming a top NFL prospect within three seasons. In 1990, he was drafted by the Dallas Cowboys. To book Emmitt Smith for a speaking event or appearance, contact Christian Speakers 360. DISCLAIMER: Christian Speakers 360 does not claim to represent itself as the exclusive agent for Emmitt Smith. Christian Speakers 360 is a booking agency that represents organizations seeking to hire Christian athletes and celebrities such as Emmitt Smith for speaking engagements, personal appearances, product endorsements and corporate entertainment. Fees on this website are estimates and are intended only as a guideline. Exact fees are determined by a number of factors, including the location of event, the talent’s schedule, requested duties and supply and demand. Christian Speakers 360 makes no guarantees to the accuracy of information found on this website and does not warrant that any information or representations contained on this website will be accurate or free from errors. We are often asked how can I find out who is Emmitt Smith's agent? To find Emmitt Smith appearance fees and booking agent details, you can contact Emmitt Smith's agent, representative or manager through Christian Speakers 360 for speaking fee costs and availability. Christian Speakers 360 can help your company choose the ideal Christian speaker or entertainer for your next event. To hire Emmitt Smith for an appearance, speaking event or endorsement, contact Emmitt Smith's booking agent or rep for more information.